Ionizing radiation causes damage to normal tissues located in the field of radiation. Oral mucositis may result from irradiation that induces the death of the basal cells of the mucosal epithelium, usually two weeks after the beginning of radiotherapy (RT). Oral mucositis is an inflammatory response of the oral mucosa to the use of antineoplastic drugs or ionizing radiation that are used in treating head and neck cancer. Discomfort or severe oral pain may be caused by oral mucositis, as well as difficulties on drinking, eating, swallowing and speaking, which impair patient's quality of life. It starts asymptomatic, later on, an erythema appears and it may be followed by erosion or ulceration of the oral mucosa. The ulcerations may be typically covered by a white fibrinous pseudomembrane. 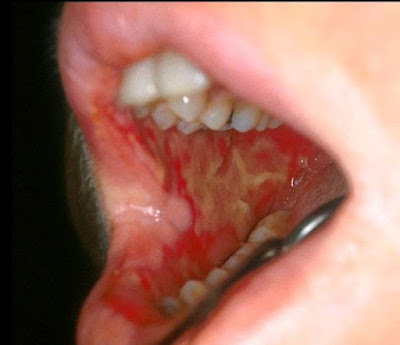 Histopathological evaluation of mucositis reveals mucosal thinning leading to the formation of a shallow ulcer thought to be caused by inflammation and depletion of the epithelial basal layer with subsequent denudation and bacterial infection. The World Health Organization (WHO) Oral Toxicity Scale (OTS) is widely used for assessing the severity of scoring oral mucositis.